In Dubee v. P.F. 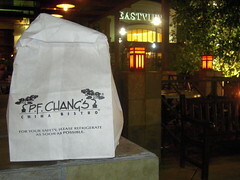 Chang’s China Bistro, Inc., No. C 10-01937 WHA, 2010 WL 3323808 (N.D. Cal. Aug. 23, 2010), a putative wage-and-hour class action, defendant P.F. Chang’s China Bistro, Inc. brought a motion to transfer the action to the Central District of California pursuant to the “first-to-file rule” due to an earlier-filed action pending there, Vasquez v. P.F. Chang’s China Bistro, Inc., No. CV 09-01408 DSF. Dubee, supra, *1. Plaintiff opposed, arguing that the first-to-file rule does not apply since the actions are not sufficiently similar. Judge William Alsup of the Northern District of California denied P.F. Chang’s motion. In March 2010, plaintiff food server filed a putative class action against defendant P.F. Chang’s China Bistro, Inc. for failing to provide meal and rest periods, pay wages, and accurate itemized wage statements, as well as for engaging in unfair business practices. The earlier-filed case, Vasquez, was originally brought in October 2008 against defendant P.F. Chang’s China Bistro, Inc. in Los Angeles Superior Court. Id. Vasquez was initially a putative class action that alleged that defendant failed to properly deduct equipment and costs from employee paychecks, provide meal and rest periods, provide accurate itemized wage statements, and pay all wages due to discharged or quitting employees, as well as engaged in unfair business practices. But the plaintiff in Vazquez never filed a motion for class certification. [The rule] is an underdeveloped but generally recognized legal doctrine regarding duplicative lawsuits. Its sole purpose is to promote judicial efficiency. “While no precise rule has evolved, the general principle is to avoid duplicative litigation.” Colorado River Water Conservation Dist. v. United States, 424 U.S. 800, 817 (1976). The Ninth Circuit has held that “[t]he principles of comity allow a district court to decline jurisdiction over an action where a complaint involving the same parties and issues has already been filed in another district.” Barapind v. Reno, 225 F.3d 1100, 1109 (9th Cir. 2000). As such, under the first-to-file rule, a district court may–at its discretion–transfer, stay, or dismiss an action when a similar action has been filed in another district court. Alltrade, Inc. v. Uniweld Products, Inc., 946 F.2d 622, 625-26 (9th Cir. 1991). When deciding whether to apply the first-to-file rule, the court looks to three threshold factors: (1) the chronology of the two actions; (2) the similarity of the parties; and (3) the similarity of issues. Ibid. The two actions need not be identical; it is enough that they are “substantially similar.” Nakash v. Marciano, 882 F.2d 1411, 1416 (9th Cir. 1989). [W]hile the Vasquez action was originally filed as a putative class action, it is now proceeding solely as an individual action. In the instant case, plaintiff Dubee is proceeding as a representative plaintiff on behalf of himself and all other California P.F. Chang’s employees that are similarly situated. While this class–if certified–could encompass the plaintiff in Vasquez, the claims asserted by the plaintiff in Vasquez do not (and will not) encompass plaintiff and the putative class in the instant action. For this reason, the two actions are not substantially similar with respect to the parties involved.